And after it was awesome for dinner the first time, it is awesome again in chili or on sandwiches. But it starts with cooking it right in the first place, and after much experimentation, I believe my tri-tip is as good as any, as proven by my first place showing in a friends’ office potluck and by humiliating another friend’s much ballyhooed tri-tip in a campground showdown. Okay, it wasn’t exactly Throwdown with Bobby Flay, but it is good tri-tip, and with commercially purchased products, it just isn’t that hard to do. I start with the right cut of tri-tip. Many tri-tips start thick on one end, and taper down to a skinny end. While this may be good for groups where some like it rare and some like it well-done, I prefer a cut that is more uniformly thick from one end to the other for more even cooking. I also always trim the fat layer off the bottom. Some tri-tip afficionados like the fat layer and the flavor it lends, but for me it just isn’t worth the flame-ups on the fire and it doesn’t allow the marinade to penetrate as deeply into the meat. The best marinade I have found is Allegro’s Gold Buckle Brisket Marinade, which I can usually get at my local Von’s. I soak the tri-tip in a ziploc bag full of that overnight before I plan to cook it. Just a whiff of the marinade will set you to salivating, and frankly, the tri-tip can be grilled with just the marinade. But before I start grilling, I like to baste it well in Woody’s Cook-in Sauce. Unlike most bbq sauces, there is little or no sugar in it, so you can safely add it to the meat in the beginning without worrying about it carbonizing (burning) like most sauces will. It is a concentrated sauce with some vinegar and oil in it that literally “cooks in” the meat and adds a great tang to the meat. It isn’t always easy to find, but I have found it in most of my grocery stores at one time or another. I prefer to use charcoal to grill my tri-tip, but gas can work in a pinch. Either way I like to add damp oak wood chips to the fire, either directly for charcoal, or in a smoker box for gas grilling. My favorite (and fortunately readily available) is Jack Daniels Wood Smoking Chips, made from actual oak casks originally used to age their famous whiskey. Again, the purists will use straight oak wood for the grilling itself, but I don’t usually have access to that. Regardless, the oak chips add great flavor. What as sweet piece of meat! From this point, grill as you normally would. I usually do it four inches or so above the coals for 20-30 minutes per side, depending on the thickness. Generally (if the fire isn’t too hot), once the under side is well browned and looks cooked, you can turn it over and do the other side for roughly the same time. On a two to three inch thick piece of meat, this should yield a nice medium rare. If the coals are too hot, or you have to cook low to the coals, a piece this thick will be more difficult, as it will tend to cook the outside quickly and leave the inside very rare. It really doesn’t need any condiments at all, but if you wish, you can serve with fresh salsa or bbq sauce. Weight Watchers Info: 4 PointsPlus per serving. Based off Weight Watchers' listing for beef sirloin, lean, trimmed. 3 PointsPlus for 3 ounces of cooked tri-tip. 1 PointPlus for 1-2 tablespoons of Woody’s Cook’n Sauce. Trim the fat layer off the bottom of the tri tip. Soak the tri-tip in a ziploc bag full of the marinade overnight. 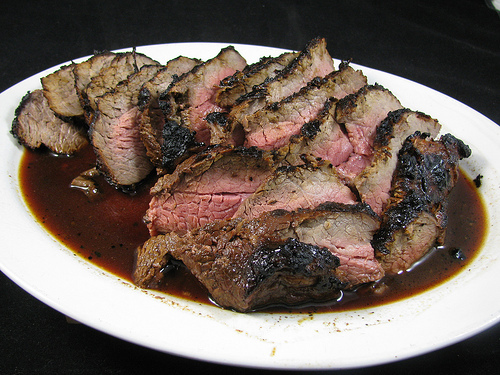 Remove tri tip from marinade when ready to cook. Baste it well in Woody’s Cook-in Sauce. Add damp oak wood chips to the fire, either directly for charcoal, or in a smoker box for gas grilling. Grill as you normally would. I usually do it four inches or so above the coals for 20-30 minutes per side, depending on the thickness, to yield a nice medium rare. Yield: A 2-1/2 to 3 pound tri-tip ( as seen here) will easily serve four to six people, depending on their appetites and your desire for leftovers!